Classic City Cooking: Pre-Order Now! 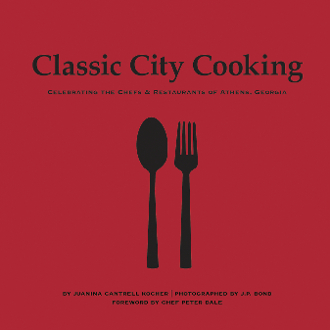 Classic City Cooking is a cookbook written by Athenian Juanina Cantrell Kocher and photographed by J.P. Bond. This coffee-table style, hardcover book is based on the restaurants and chefs of Athens, Georgia. Classic City Cooking features recipes from 14 local restaurants, an extensive honorable mentions section, and foodie input from local influencers and celebrities including The Whigs, Darius Weems, Widespread Panic, Billy Bennett and more. Classic City Cooking is a perfect gift for local foodies, UGA students, graduates and anyone with a love of food, beverage and the south’s Classic City.